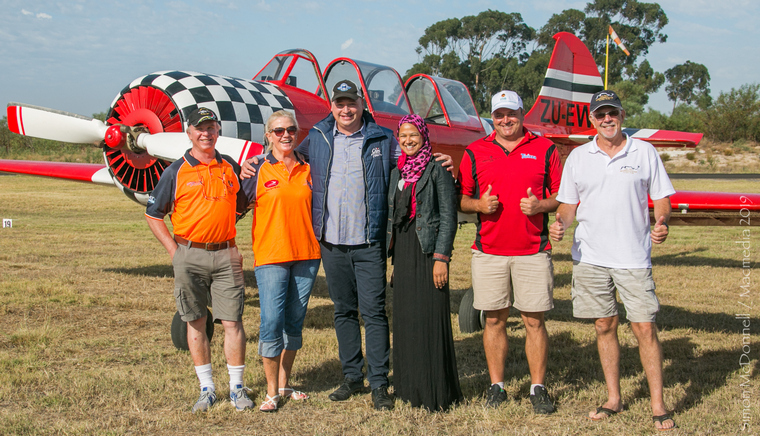 The South African Power Flying Association held its first Speed Rally in the Western Cape on the 2nd February 2019 at the Morningstar airfield. 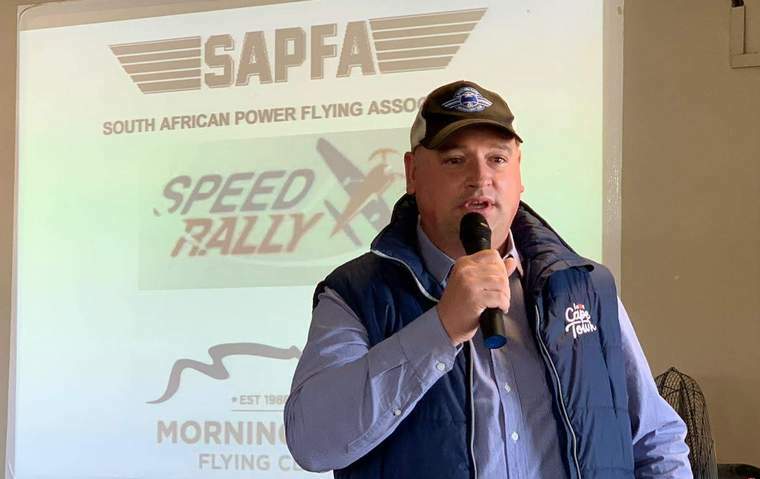 Building on the success of the previous two speed rallies held late last year, and with the Aviators in the Cape also wanting to be part of this type of event, SAPFA decided in conjunction with the Morningstar Flying Club to hold the event there and branded it as the Cape Rally. 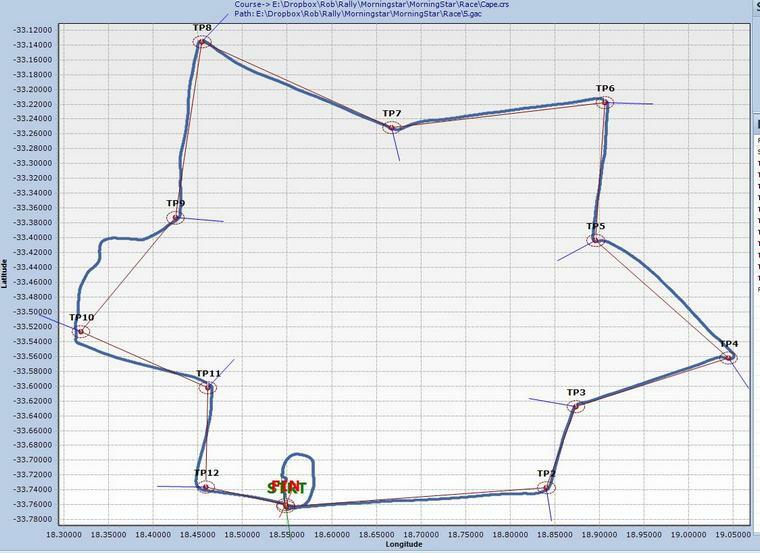 The event is one that is flown at full speed under handicap conditions, the course is around 120 nm long, has 11 or so turning points, with each turning point identified with a correct photograph. Planning started prior to December 2018 and entries started in earnest at the beginning of January. 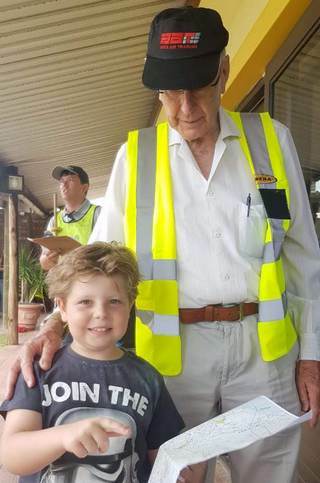 Within three weeks the entry list had reached its maximum of 30. 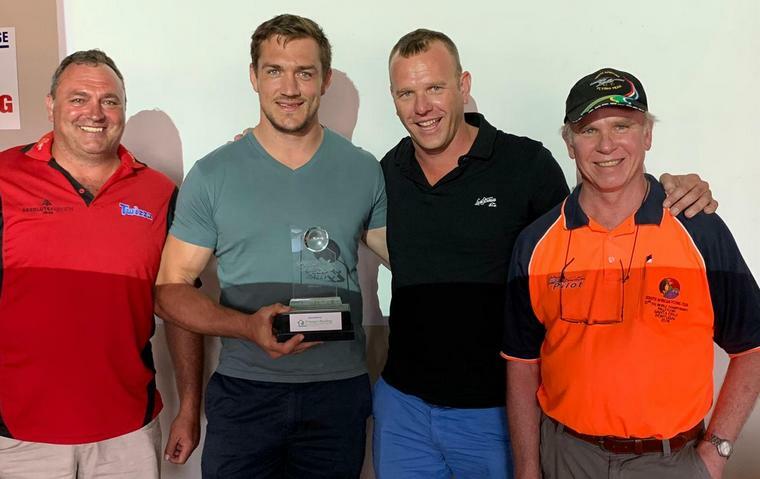 One dedicated team of David Ross and James Braid in their Sling flew down all the way from Johannesburg, two other teams from Mossel Bay could sadly not get to Morningstar on Friday due to low cloud. Friday saw a fairly full day of test flights as most aircraft had never participated in handicap events before and needed to establish a reference speed. The day was sweltering and temperatures were in the upper 30's although it provided for excellent visibility for flying. 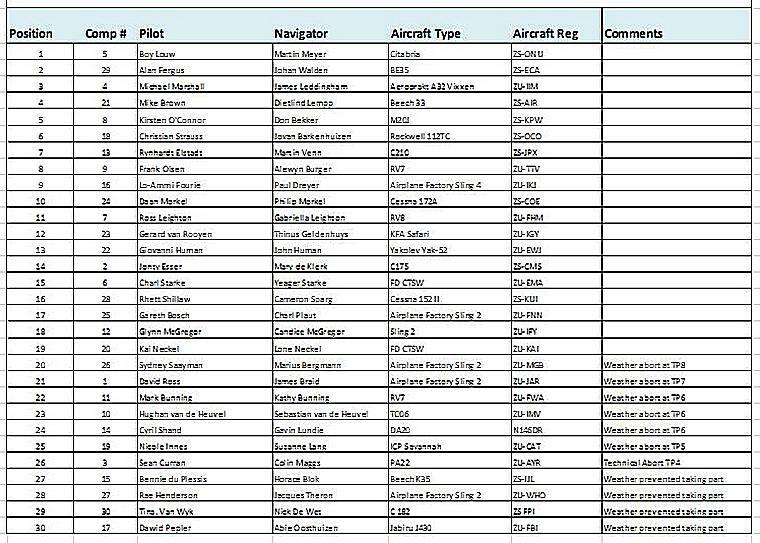 Test flights went on untill late with the start list available after the briefing. 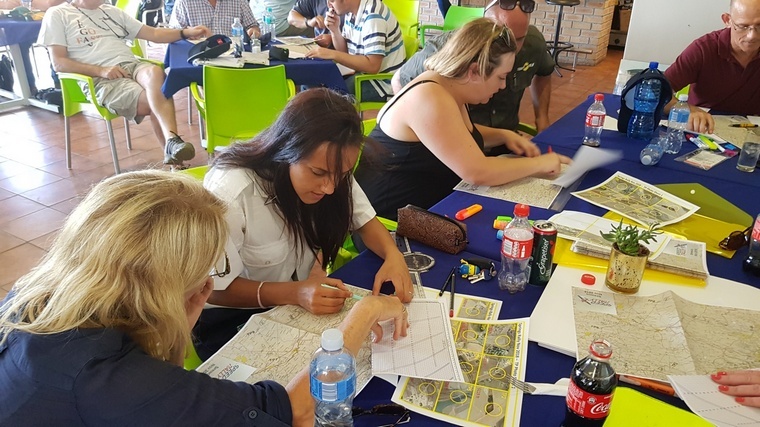 Mary de Klerk had arranged to hold a training session on how to fly a Speed Rally in the afternoon, which was very well attended and included a practical map preparation session on an sample map. Mary shared many the tips and tricks of how to follow the map features and timing points. Thereafter at 6h30, Rob Jonkers took to the stage and provided a briefing on what to expect for the next day in terms of the planned route, how many turn points, distance, departure and arrivals protocol as well as how the scoring system would work with the expected weather conditions, which looked as if some uncharacteristic rainy weather may appear. All the competitors were treated to a briefing on Steroids on Friday night with the Speed Rally event's organiser Jonty Esser having set up a show for the teams with a real life lights, camera, action sequence, where each team were introduced with their team theme song and handed their race numbers. Jonty also introduced the teams to the Speed Rally website where a Speed Rally ranking system was created, with team profiles and their leader board position. The evening ended with a lamb on a spit braai, before retiring for the night, although the officials struggled to navigate to their guest house in the pitch dark, having got lost somewhere in Chatsworth and clearly needing some sharpening up of basic navigating skills. Saturday morning saw nice clear skies above Morningstar although there was some low cloud in the north, which was lifting. Rain was predicted for later in the day. The briefing started at 8h30, which was a shortened version just to cover the basics of the route, radio procedures and weather. Thereafter the Deputy Mayor of Cape Town Alderman Vos addressed the teams, wishing them good luck and promoting such type of events in support of the local economy of the Western Cape. 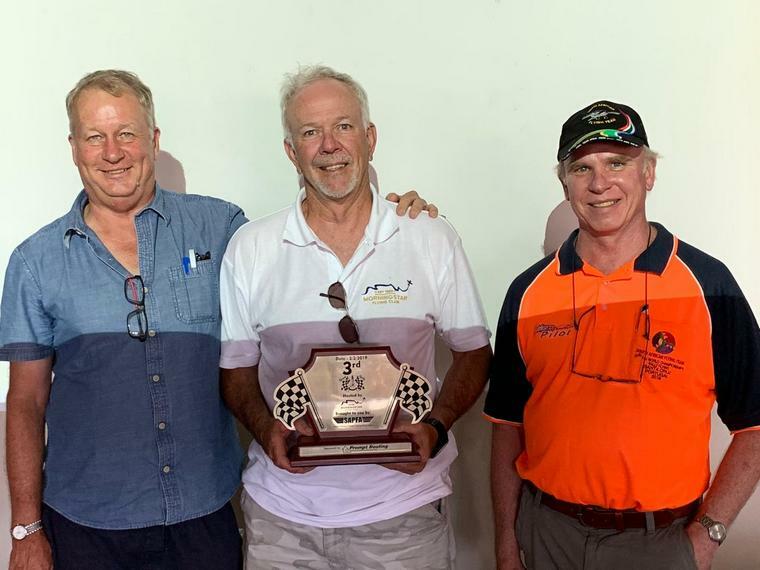 Vos also voiced his enthusiasm for the upcoming World Rally Flying Championships are being held in the Western Cape in Stellenbosch in 2020. 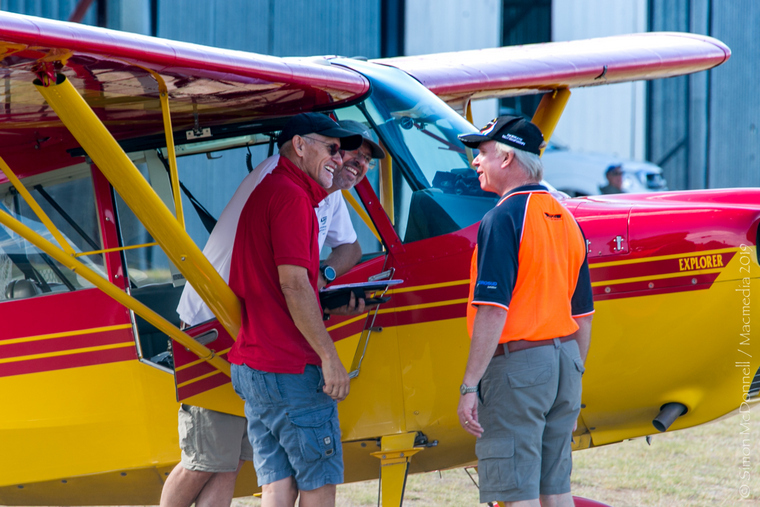 With the briefing over, teams prepared their aircraft with marshals assisting in parking sequence while the organisers got the various documents in order. Each team would then receive an envelope with a map, turn point photos, a minute marker and a GPS logger to record their track. Aircraft were then scrutineered with all portable electronic devices sealed in bags, and although no onboard systems were disabled, it relied on an honour code to not utilise onboard GPS as a Navigation aid. The course was however designed as such that GPS would be of minimal benefit. 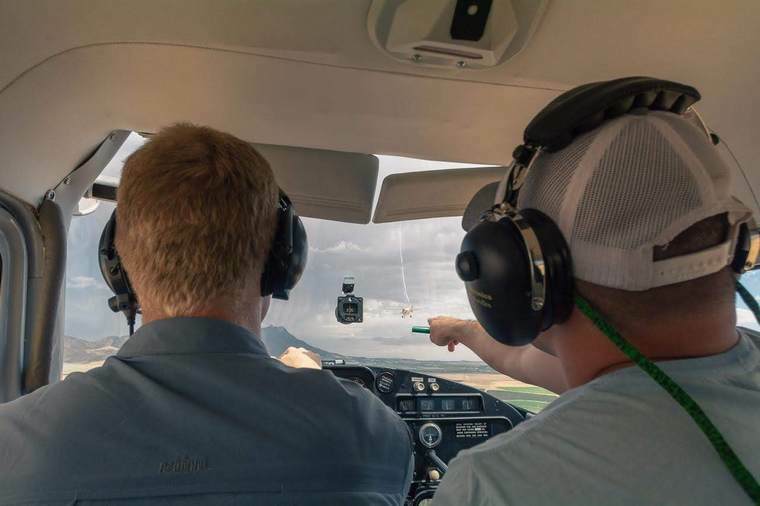 The intent is that everybody uses the basic skills of navigation plotting and flying and operate as a team in terms of cockpit workload. The course layout with its short legs definitely ensured that crews utilised their combine resources work- sharing became all the more important. The idea would be that each crew would receive a pre-plotted map already complete with the route, turning points, headings, altitudes, where the map would not have any latitude/longitude or grid references. This would be provided 20 minutes prior take-off to allow route orientation and the plotting of minute markers. 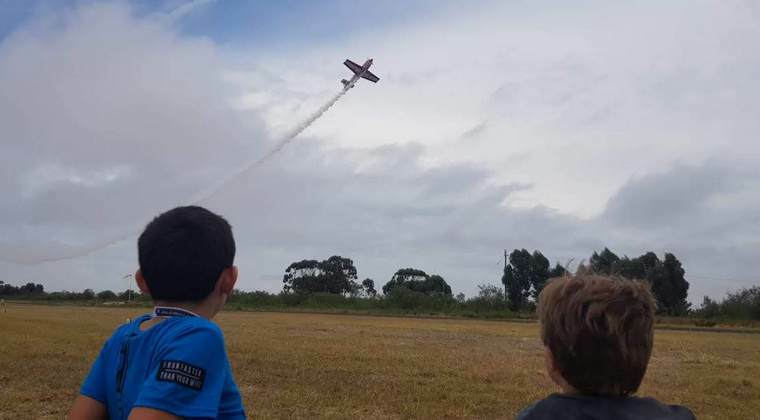 In this format, there are two objectives:- fly against a pre-determined handicap speed for each aircraft and fly the shortest route around the course which would consist of a minimum of 10 turning points. Thus, any aircraft would be able to compete, from slower LSA aircraft to the fast turbo singles and twins. The idea would be to test the speed capability and navigation skills of each crew against each other, where the most accurate flying and turn performance management would win the rally. Scrutineers Chareen, Ray and Frans (Pilot Insure) were on hand to seal up all portable GPS capable devices, and also handing out papers at the allotted time. To assist the teams at getting their take-off roll accurate, a starting colour panel was used, which was set up next to the start line on the runway, which would release them at their allotted time slot. 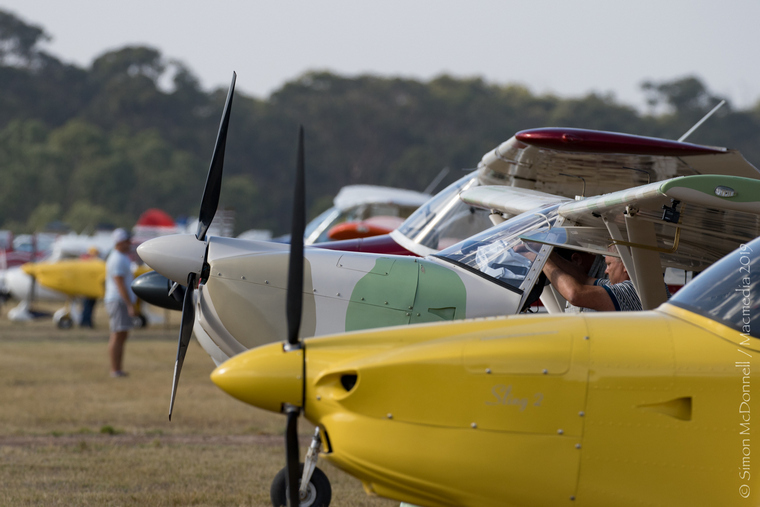 Each team then received their envelopes with their loggers at their 20 minutes prior take-off time, and the teams taxied to the starting line. 1st take-off was at 10h15 for the slowest aircraft and last take-off at 10h50 with the planned arrival at 11h30. 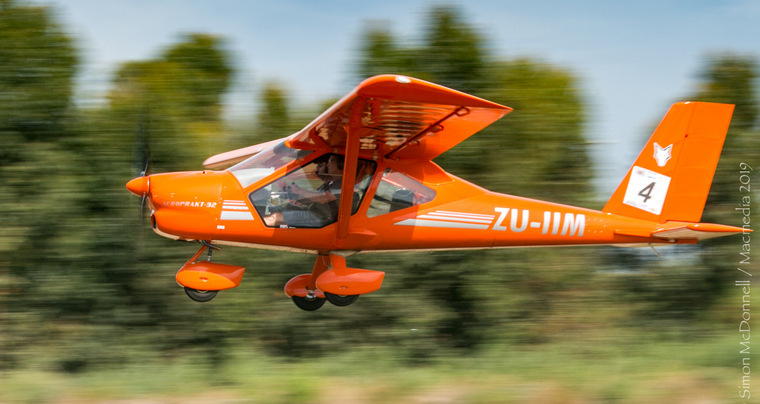 The nippy RV8 ZU-FHM would only need 40 minutes to complete the course. Although the weather predictions appeared to show some variable cloudy weather with rain patches, it was good weather over the field and to the east, but as the teams headed towards the coastal area, banks of low cloud were rolling in which was very uncharacteristic for the summer period. A number of teams had to withdraw from the course, others diverted to find their way around, so the eventual result was unfortunately not representative of achieving an even field of results but everybody enjoyed the portion of the course that was weather free. The turn points were challenging to find and it seemed turn points 2 & 4 were missed by many. Turn point 4 had its corner cut by many and although crews were briefed to take care to go round the turn points. After all teams having returned and were safe on the ground, the scoring team got to work to analyse the results, which proved a challenge, as the idea is to be able to post a score, even with penalties, but as some diverted for home, the scoring system could not achieve a workable score. 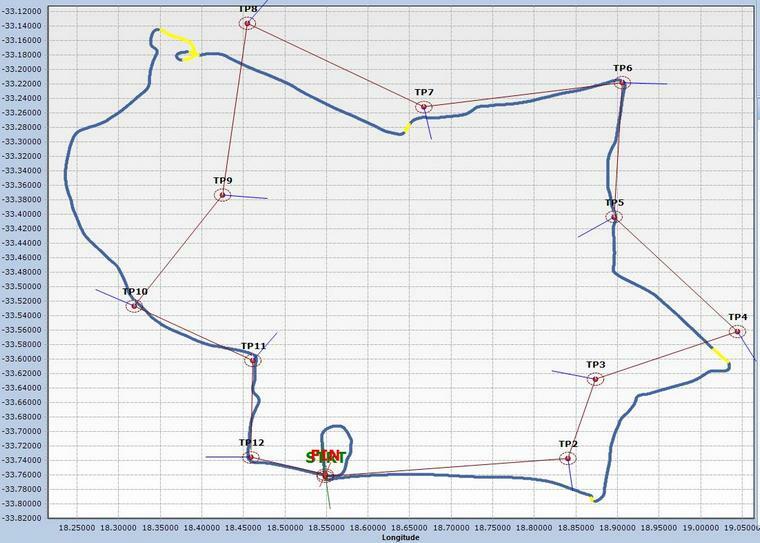 One of the improvements being considered in the scoring program is to find the means to score even with diversions. 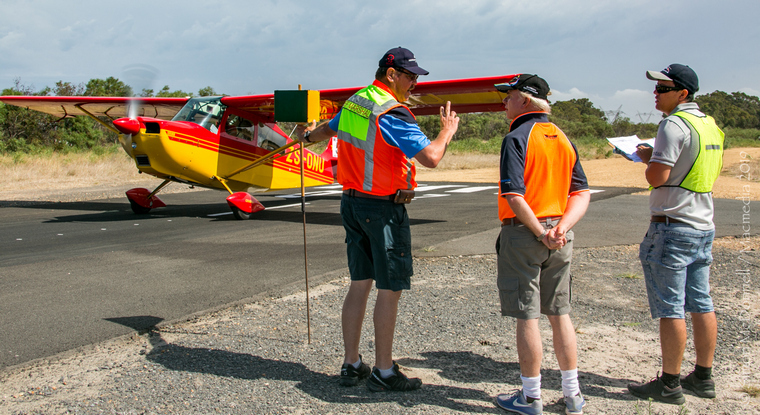 The team Rhett Shillaw and Cameron Sparg in ZS-MLE pointing out - "Follow that Plane"
The results were completed by around 13h45 and prize giving commenced at 14.15 pm. The first up on the prize giving programme was to show some of the interesting tracks and given the weather conditions, showed how many had to divert around it. There were the odd few that went wandering off course in the good weather area which had the audience in fits of laughter. Jonty first handed over the host club floating trophy to Club Chairman Ross Leighton after which the placings for the best handicap speed and thereafter the most accurate / shortest route flown. 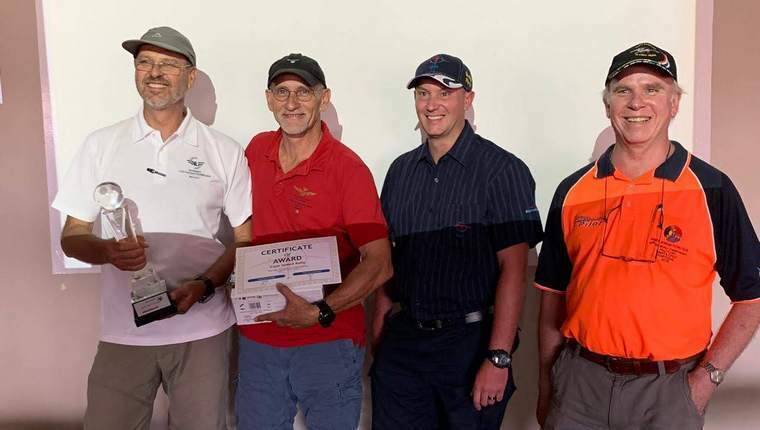 The overall winners in the best handicap speed were the team of Boy Louw and Martin Meyer in a Citabria ZS--ONU, in second place was Alan Fergus and Johan Walden in their Beach V35B ZS-ECA, and in third place Michael Marshall and James Ledingham in a Foxbat A32 ZU-IIM. The first three placings were the only crews who managed a clean penalty free round. Events like these cannot be held without the valuable support of sponsors which included Dart Aeronautical who provided the winners prizes, Sideslip Aviation with avgas vouchers and lucky draw vouchers, Diemerskraal Airfield with avgas for the youngest team home, Pilot Insure, Wings & Things voucher while Skye Plastics assisted with fuel cans, Aeroshell, Flightline Weekly, and Prompt Roofing for race stickers, caps, trophies, meals. Also to the sponsors Dart Aeronautical who provided the winners prizes, Sideslip Aviation with avgas vouchers and lucky draw vouchers, Diemerskraal Airfield with avgas for the youngest team home, Pilot Insure, Wings & Things voucher, Skye Plastics with fuel cans, Aeroshell, Flightline Weekly, and Prompt Roofing for race stickers, caps, trophies, meals. 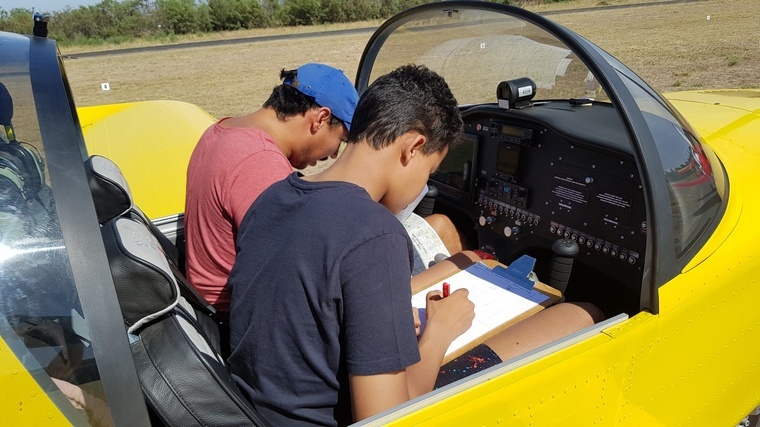 Our SAPFA officials Chester Chandler and Chareen Shillaw engaged with budding young aviators and providing them with some air experience, showing how to map read, sitting in an aircarft to familiarise the instrumentation, and we wish them well for becoming pilots one day.